Note: film review was previously posted as part of the review for Severin Films’ Zombie 4 Blu-ray. Claudio Fragasso did a lot of work to finish Lucio Fulci’s Zombie 3, so it makes sense that he would inevitably have some interest in continuing the theme of the series, if not expressly crafting Zombie Flesh Eaters 3 as a sequel to Fulci’s work. Like most other Italian films and the Zombie films in general, the title of Zombie Flesh Eaters 3 has wavered throughout its releases – first releasing as After Death before getting the Zombie 4 sequelization attached to it and then also following Zombie 3‘s alternate title as Zombie Flesh Eaters 3. Whatever the name, Fragasso’s film (written by his partner Rossella Drudi) changes things up a bit for the Zombie franchise by introducing voodoo-resurrected undead instead of the traditional virus. Nevertheless, the actual experience is quite similar: it’s cheesy, ultraviolent, and not very good from a conventional cinema standpoint, but its multitude of flaws become charming in their own ways. Drudi basically follows the same template as her other script for Zombie 3, except the environmental aspect is replaced with voodoo – still, Zombie Flesh Eaters 3‘s theme ultimately deals with science overstepping the boundaries of life and death. The setup is about as bare bones as it gets – for really no reason, a group of friends visit this zombie-infested island 20 years after its voodoo curse, and all of them end up getting eaten in some particularly malevolent way. On another part of the island, Chuck (Joe Stryker), David (Massimo Vanni), and another girl are researching the caves of the island to find out more about the experiments that had been done 20 years previously, and most of them also wind up as chuck meat. As is so often the case with Fragasso films, Zombie Flesh Eaters 3 spends little time with its characters, instead effectively pacing the film out so that they can all be killed at opportune times. The draw is not so much the plot – which suffers from pretty much every ailment one can think of, lacking direction and more frustratingly a conclusion – but the methods that Fragasso employs to kill off his cast. The zombies this time around are a bit more menacing than the Filipinos of Zombie 3, most of them covered in rotting burial garments that add great effect to their visage. They also tend to know kung fu and have some form of sentience, also contributing to the mayhem. Mostly, though, it’s the special effects that carry the film – Franco Di Girolamo returns and does a consistent job here with a lot of peeling, ripping, and eyeball-plucking makeup art. Again, Zombie Flesh Eaters 3 isn’t a particularly good film and in some ways Fragasso recognizes this during the movie; but watching it simply to appreciate the gore, the cheese, and the downright catchy “Living After Death” song from Al Festa is a good way to enjoy this cinematic experience without thinking too critically. And you definitely don’t want to spend too much time on the ending – neither Fragasso nor Drudi did. Zombie Flesh Eaters 3 comes to UK audiences via a new Blu-ray from 88 Films, joining the Italian Collection at #47. The film gets a new 2k scan of original film elements, and for the most part 88 Films’ scan looks nearly identical to Severin Films’ US release. Whether it truly is the same scan, I’m not sure – but taking a look at the comparison stills from both releases, it certainly looks that way. As stated in the Severin review, the film looks fairly good despite the obvious issues with the source material. The picture quality takes on a heavier grain presence, and the occasional soft picture is certainly present here. But color correction is good, and the scan does navigate particularly difficult foggy images quite well, and even the blown-out whites are toned down here. First image is 88 Films, on hover is Severin Films. Similarly, the audio presented is an English LPCM stereo track. It sounds good, except for a few instances of muffling. Nothing impressive or distracting about this track, though. Also included are English subtitles. Extra features are a bit more limited than Severin’s offering. However, 88 Films does provide the same interview with Claudio Fragasso and Rosella Drudi that Severin made for their disc. Also included is an 18 minute interview with Allan Bryce about video nasties in general and their releases on VIPCO. An SD trailer is the only other thing on the disc. The package does come with a slipcover, reversible cover artwork, and an essay by Calum Waddell. For UK fans unable to grab Severin’s slightly more robust release, this is still a great version of Zombie Flesh Eaters 3 or Zombie 4 or whatever you want to call it. Also, if you’re already collecting the Italian Collection it makes sense to grab this one instead. Or if you want the alternative title on your cover artwork. 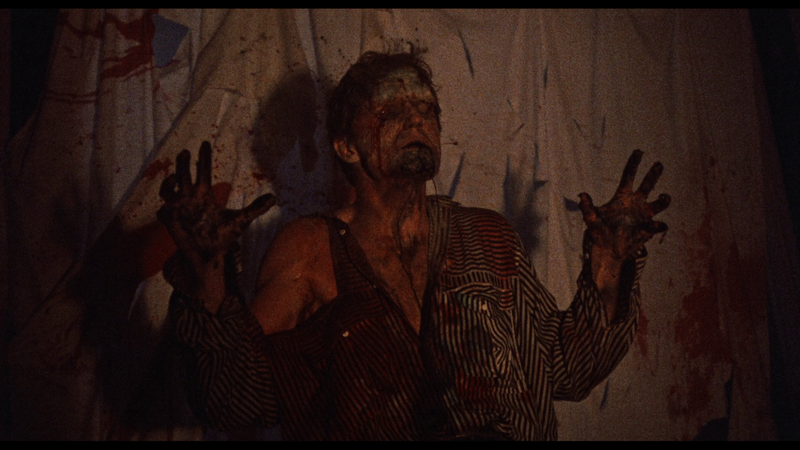 Check out the full gallery to compare Zombie Flesh Eaters 3 to Zombie 4. Zombie Flesh Eaters 3 isn't the best film in the difficultly-titled Zombie films series, but it is a good deal of fun. 88 Films' release has a super similar transfer to Severin's, but with a bit more limited extras.